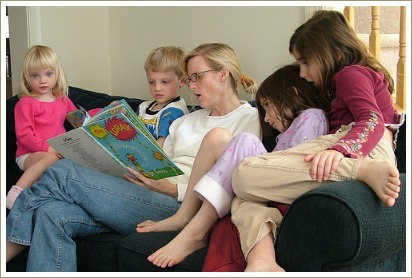 The Lorax is one of Dr Seuss's most famous books and a fantastic book to read aloud with kids. 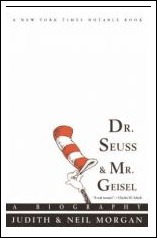 Ted Geisel (Dr Seuss's real name) wrote the book in 1970 during a visit to Kenya and it was first published in 1971. The book is interesting because it's so clearly a plea for the environment against corporate greed and destruction. Most Dr Seuss books have some kind of message or moral to them but it's usually subtle. 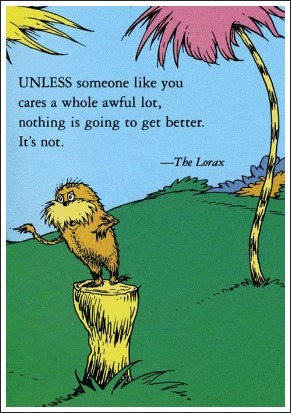 In The Lorax the message that we need to take action urgently or suffer the catastrophic consequences is clear and unambiguous. Like all Dr Seuss's books, The Lorax contains lots of fun, made-up words. Unlike his other books though, this one is illustrated in shades of mauve, plum, purple and sage-green rather than the usual primary colours. Ted's wife, Audrey, suggested this change and advances in printing technology made the new palette of colours possible. In September 1969, Ted Geisel and his wife set off on a seven-week trip around the world. Among other places, they visited Japan, Hong Kong, Cambodia, England, France, India and Israel and Ted returned to La Jolla in California eager to help the world and to fight greed and waste. Looking out at the coast which had been empty when he first moved to La Jolla but was now quite built up, he fumed about people's indifference to the environment, doodled and tried to write. But he found it very hard to make the subject funny and soon got frustrated when the book wasn't working. So Ted and his wife Audrey went to Kenya for a holiday. While they were staying at the Mount Kenya Safari Club, Ted was lying by the pool one afternoon when "a lot of elephants" walked across the mountain and the vision sparked something in Ted's mind. "I had nothing but a laundry list with me, and I grabbed it ... I wrote ninety percent of the book that afternoon. I got some kind of release watching those elephants"
The trees of the Serengeti inspired Ted to draw the Truffula trees but it took a while for him to work out who the main character of the book would be. "I looked at the drawing and that's what he was!" The book startled readers when it first came out and not everyone liked it. In many ways, it was ahead of its time because the environmental movement had not yet gathered speed when it was released in 1971. Initial sales were slower than the publisher had expected for a Dr Seuss book but the book became very popular ten years later when interest in environmental issues started to grow. In 1988 people in a small town in California protested that the book was unfair to those who worked in the logging industry. The protesters wanted The Lorax removed from the second grade reading list at a local school but the school decided to keep the book on the list. One line in the book was removed by Ted Geisel about fourteen years after the story was published at the request of two researchers from the Ohio Sea Grant Program. The researchers wrote to Ted about the clean-up of Lake Erie and he agreed to remove the line "I hear things are just as bad up in Lake Erie" from future editions of the book. The original art and manuscript of the book were donated to the Lyndon B Johnson Presidential Library in Austin, Texas and the Geisels were the President's guests at the dedication ceremony. A television version of the book appeared in 1972 and was narrated by Eddie Albert (remember Green Acres?). Ted and the animator Friz Freleng travelled with their wives to Zagreb to accept an award for the film at the International Animated Cartoon Festival. As I write this in March 2012, a new film version of The Lorax has just been released here in Australia. I went to the movies with my family today and saw the trailer and I must admit it looks wonderful, with the voices of the two main characters done by Taylor Swift and Zac Efron. I'll have to get back to see it soon! The information on this page comes from Judith and Neil Morgan's wonderful biography Dr Seuss & Mr Geisel. The authors were long-time friends of Ted and Audrey and the book gives a fascinating insight into the man, his life and his work.